The first two Regional Championships are in the books and we have three Regional Champions freshly crowned. Daniel Altavilla won during the first weekend with his Yveltal EX/Archeops NVI/Gallade BKT deck, Brad Curcio won the St. Louis area Regional Championship with his take on that same deck, and then Kian Amini won out in Southern California with his Seismitoad EX/Manectric EX/Crobat PHF deck. While players should keep in mind the results from the first two weekends of Regional Championships, which they can see here, they should recognize that taking most of the decks that performed well during the first two weekends and not making any changes to them will likely lead to failure at the coming weekend of Regional Championships. This weekend will be the first weekend where the latest Pokemon expansion BREAKpoint is legal for tournament play and it looks like it will have a major impact on the tournaments to be played in Florida and Oregon this weekend. I will not be attending this weekend of Regional Championships personally, as there isn’t a Regional Championship nearby, so in this article I want to share my thought process when approaching the new format with hopes of helping some others find success this weekend. 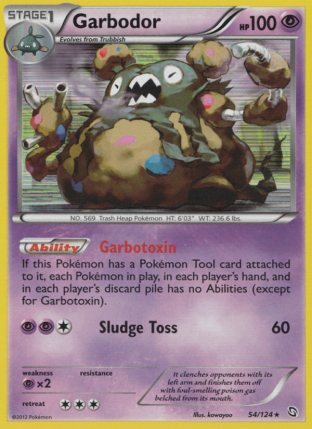 This past weekend the Sableye DEX/Garbodor DRX had a bit of a coming out party in Collinsville, Illinois, with 4 variants of the deck making it onto Day 2 of the 499 player tournament, with two of the decks moving onto the Top 8, with another narrowly missing the cut at ninth, and when all was said and done, Sableye/Garbodor finished 3rd place at the tournament. There was a bit of variety in the Sableye decks that players brought to the tournaments. Some variants were based around being able to win on prizes by using Hypnotoxic Laser and Virbank City like the original version of the deck, while others depended more on Trick Shovel to deck out the opponent. 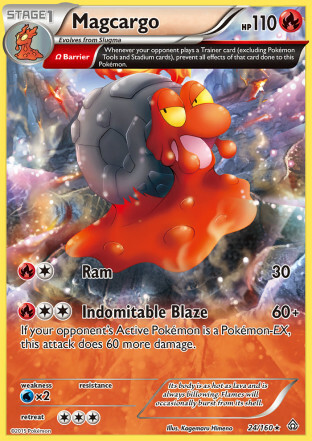 Both variants of course played Energy denial cards like Crushing Hammer, Enhanced Hammer, Team Flare Grunt, and Xerosic to keep opponent’s from being able to attack consistently. I think a lot of players were really caught off guard with the depth of strategy that was displayed from the Sableye players that made deep runs into the tournaments. We saw new strategies pop up in the Sableye deck such as Red Card into a turn 1 Ghetsis, and Pokemon Catcher even found its way back into the deck. I haven’t seen what all the Sableye lists looked like from the past weekend, so I don’t know how common this was, but using Target Whistle followed by a gust effect to lock something undesirable Active with Team Aqua’s Secret Base was also a strategy used. Sableye certainly proved its strength this past weekend and it only looks to get better with the addition of new cards from BREAKpoint. It might become so good that it forces Pokemon to ban a card to keep the format healthy, as I have discussed in previous articles and other media outlets have as well. 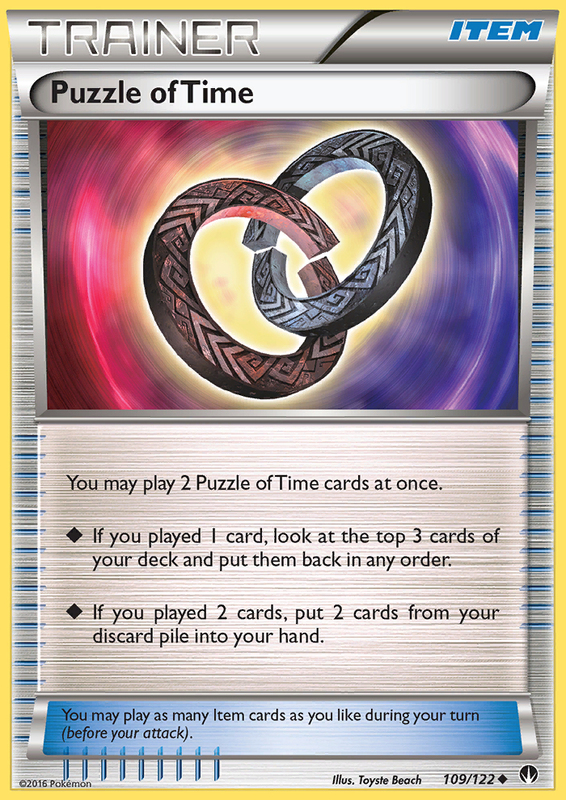 The primary new card that is receiving all of the Pokemon World’s hype is Puzzle of Time, which when you play two at the same time lets you get back any two cards from your discard pile. 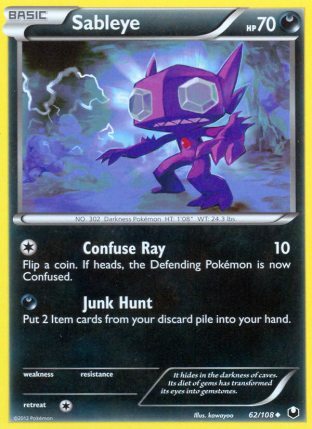 This might seem silly upon first look, as Sableye can already retrieve two Item cards from your discard pile, and with VS Seeker that can extend to Supporters, so what’s the use of fitting in even more cards into the deck? The big reason to play Puzzle of Time is so that you are able to infinitely loop Life Dew. If you Junk Hunt during your turn for two Puzzle of Time cards with a Sableye with Life Dew attached and that Sableye is knocked out, you can promote your new Sableye, play the two Puzzle of Times to get back Life Dew and one other card. Previously there would be a one turn gap where you wouldn’t have Life Dew attached. An alternate reason to play Puzzle of Time would be to get Stadium Cards back. This is good in its own right, but by having infinite access to Stadium Cards in your hand instead of having to send them back into the deck with a Rototiller from Bunnelby you can spam Delinquent multiple turns in a row. I’m not sure how good this actually is, and I would primarily focus on looping Life Dew, but this is another option opened up from Puzzle of Time. How Will Players Play Puzzle of Time in Sableye? It appears that players will be looking to dump a pair of Puzzle of Time, along with the Life Dew, to get easy early access to those cards. The big question that Sableye players will have is how many Puzzle of Time cards should they play? 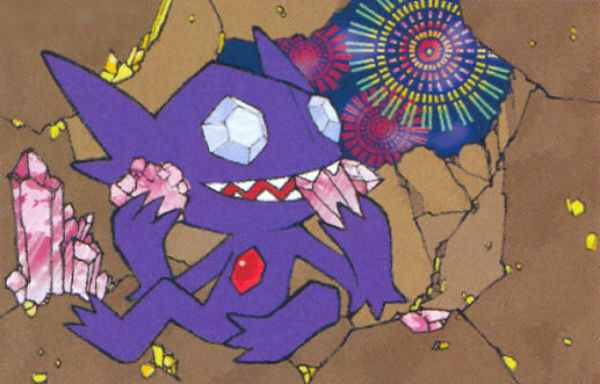 In a game, a Sableye player wants to have access to two Puzzle of Time so that they can make use of the card as part of their strategy in the game. Here are the probabilities for prizing Puzzle of Time based on the number that you play (basically the games where you won’t have access to two at the same time). 2 Copies – 19.46% of at least 1 being prized. 3 Copies – 2.51% of at least 2 being prized. 4 Copies – 0.2333% of at least 3 being prized. I think most players will opt to play three in the deck as having access to two in 97 of 100 games is pretty good, and there are only small gains in consistency by adding the fourth. I would argue that two could be an amazing play for the weekend as you will still have access to two time Puzzle of Time in 4 of 5 games, which is a pretty good probability, but it would also allow you to fit in one more card that you otherwise couldn’t, and that one card in a deck like Sableye can make a huge difference. It’s important to remember with this deck that just because you don’t have access to the Puzzle of Time/Life Dew loop doesn’t mean that you will lose that game. Sableye is still plenty good without the infinite Life Dew loop to win a game. With the threat of Sableye/Garbodor looming heavily over the BLW-BPT meta game, players will look to counter the deck at the next weekend of tournaments, and if they don’t counter it, then they will be in for a tough time. There are going to be two ways that players will approach the matchup, I believe, which will be to protect their Energy and to also play decks with an Item lock component. The way that you protect your Energy is by playing a Pokemon with Omega Barrier, which prevents your Pokemon from being affected by your opponent’s Items. There are only three Pokemon that will be relevant to this strategy, and those are the Regirock promo, Primal Groudon EX, and Magcargo PRC. In this case, all of the Sableye deck’s Crushing Hammers, Enhanced Hammers, Team Flare Grunts, and Xerosic will have no effect. I personally wouldn’t feel good about using Omega Barrier as my strategy to counter the deck in a deck that isn’t built entirely around the concept. 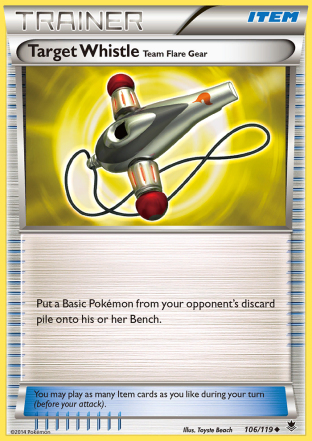 By using an Omega Barrier Pokemon as your strategy to counter the deck you’re still leaving yourself open to having something get locked Active via Target Whistle (and it can be discarded by your opponent with either Trick Shovel or Delinquent, so even if you try to avoid discarding Pokemon, they can still end up in the discard). 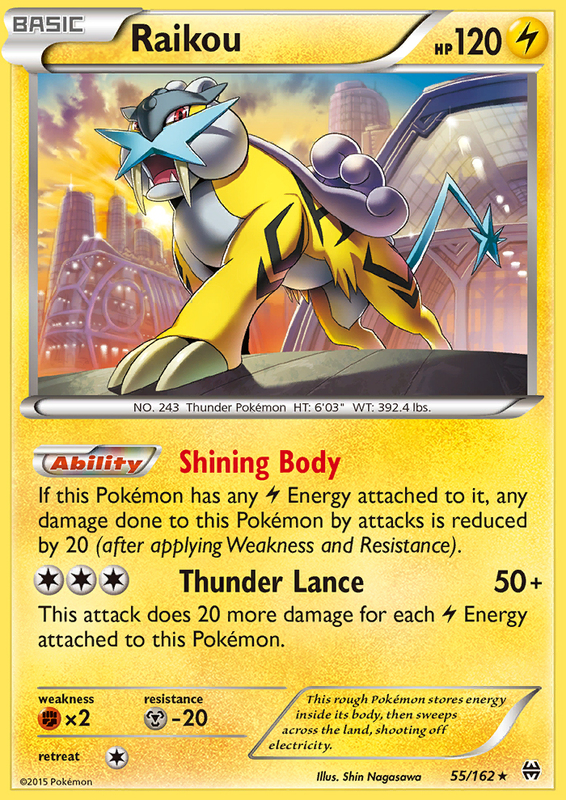 Additionally, as soon as you are out of Lysandre, Xerosic, or VS Seeker to retrieve those cards than you’re at the mercy of the infinite Life Dew loop, and may be able to do nothing except take useless knockouts until you deck out. The best strategy for countering the deck has to be Item Lock as it prevents them from being able to execute their strategy at all. I don’t think Trevenant would be a good idea, even with the BREAK, as Dark decks should be big in the meta game. 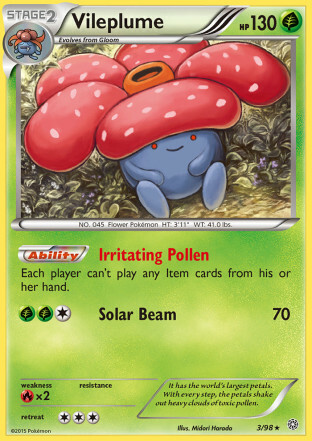 That leaves Vileplume and Seismitoad EX as being the most legitimate counters to the deck as both can shut off the deck’s entire strategy. If I were going to one of the two Regional Championships this weekend I would play a deck that included either Seismitoad EX or Vileplume AOR, and if I didn’t play a deck using one of those cards I would be playing Sableye myself. Is Sableye a Good Play? Absolutely! If there is one thing that I have learned in this game it is that the majority of the player base will not take the steps necessary to counter a broken deck concept, allowing that concept to do well at tournaments, even if there are counters available to it. Additionally, there will be another large grouping of players that will believe they have taken the necessary steps to counter a deck when they really didn’t, causing them to lose to that deck in tournament play. In addition to these groups, that is the group that didn’t try and the group that tried and fail, there are going to be the players who take an awful matchup to Sableye to try to gain an advantage on everything else that is being played. This will lead to a large portion of the player base being vulnerable to being taken down by Sableye decks at this weekend of Regional Championships. There will be a solid group of players that properly counter Sableye decks, but the people who do end up playing Sableye won’t be playing them for the majority of their rounds and decks like Yveltal, which theoretically can counter Sableye, aren’t auto losses for Sableye by any means and can quickly turn into an auto win matchup for the Sableye player if they are playing against a less skilled opponent. As covered previously, Item Lock is very strong against the Sableye deck so it will be a natural inclination for players to pick up decks like Seismitoad EX/Crobat PHF and Seismitoad EX/Giratina EX to counter the deck. I am not sold that these decks even beat Sableye decks consistently. I’ve seen a lot of players point to Puzzle of Time being the magical formula for how Seismitoad decks will be taking down Sableye decks by being able to get back their Double Colorless Energy, but from the testing I did with Seismitoad EX/Slurpuff PHF, which is more anti-discarding than the other two variants I mentioned, Puzzle of Time wasn’t very good in the deck. Even though I only played one Professor Juniper in my list and made a heavy emphasis on using Colress as my core Supporter, I just wasn’t drawing into two Puzzle of Time cards at the same time to make them very worthwhile. A big reason for this is because in hands with a single copy of the card, that was generally the most logical card to discard with cards like Ultra Ball and Computer Search. This might not be that much of a concern against Sableye decks in particular, however, as you won’t be prize trading them, so you can make use of something like Skyla to grab a second Puzzle of Time piece to get back your Double Colorless Energy, but against other decks it isn’t really a great fit as you are going to want to be using N quite a bit as the game goes on to keep your opponent out of resources. In addition to Seismitoad decks being a bad play, I also expect M Rayquaza EX to be a bad play, as I expect around 30% of the meta game, between Sableye and Seismitoad EX/Giratina EX, to be Energy disruption decks. Blastoise wasn’t really a good play for the first two weeks already, but it will only get worse with an increase in Sableye decks, so if you’re still holding onto it, it’s probably time to move onto another deck. 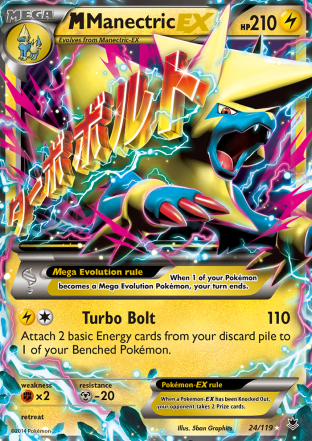 Two decks that were fairly well suited for the past weekend of Regional Championships, but which may be in danger of being bad plays for the last weekend of Regional Championships are M Manectric EX and Vespiquen/Flareon decks. What makes this deck vulnerable to the Sableye deck is that it has the potential to be locked out of the game by an infinite loop of Life Dew. Once a player is out of Lysandre, VS Seeker, and Tool Scrapper, they will have no real means of taking another prize against an infinite Life Dew loop. I don’t want to entirely count this deck out though, as it does have the backup option of using Assault Laser to try to snipe prizes later in the game, and that could be enough for it to be able to pull off wins against Sableye. Vespiquen/Flareon decks on the other hand will be looking for ways to keep an attacker powered up without losing their Energy. They will most likely turn to including Magcargo (at the cost of Wobbuffet perhaps?) as their Sableye counter. Magcargo comes equipped with the Omega Barrier ancient trait, which will prevent its Energy from being removed by cards like Crushing Hammer and Team Flare Grunt. I am not entirely sure if Magcargo will end up being enough to push Vespiquen/Flareon decks over the top. 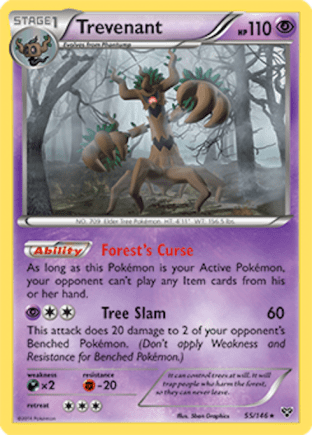 The big problem I see with the card is that it only does 60 damage against non-EX’s, which means it doesn’t even knockout a Sableye in one hit, which means Sableye can get 4 resources out of their discard for every Sableye that gets knocked out, which means they can be doing a lot to disrupt the Vespiquen player to try to run them out of resources. A major positive of Magcargo is that it does do 120 damage to EX’s, so any time a Vespiquen player can find time to hit a Lysandre, they can easily knockout any Shaymin EX or Jirachi EX with Magcargo, so Sableye players will have to take care of what they have on their bench to avoid losing because of prize liabilities that they left on their bench. These two decks still have a lot going for them against a lot of the other decks in the field, so they still merit some play and consideration. The soft counters to Sableye are probably enough to get past less skilled Sableye players, but I would expect the good Sableye players to be able to beat these two decks most of the time. This is actually a deck that saw some play this past weekend in California. Stefan Tabaco finished 6th place with the deck, Alex Koch 11th, and Joseph Sanchez 12th. 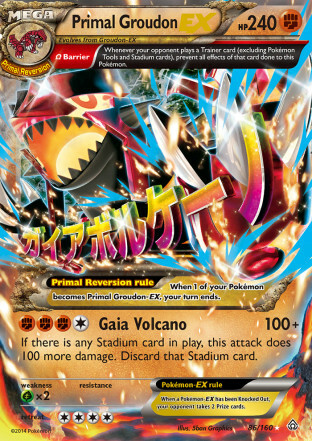 What has to be the most exciting prospect for people thinking about playing Primal Groudon EX is that it already had a good showing in a meta game that was supposed to have a lot of Vespiquen. Here is the 11th place list that Alex Koch played and posted onto Virbank City. This list is pretty ingenious, even in regards to a meta game without a lot of Sableye. The deck has a very clever strategy to get around Vespiquen decks of removing all of their Double Colorless Energy to render Vespiquen into a non-attacker in that matchup, and then it can use either Wobbuffet or Bunnelby with a Silver Mirror to finish off the game as Flareon was the only Blacksmith target in Vespiquen decks this past weekend. 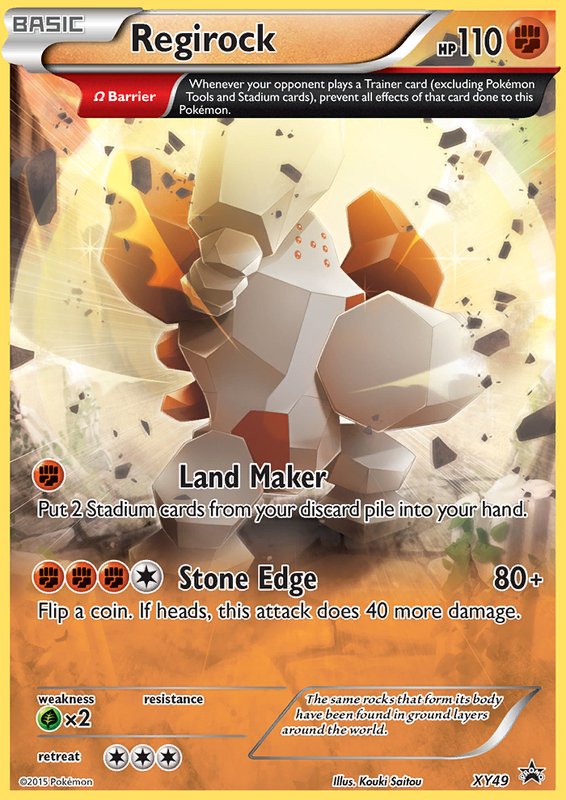 For this weekend of tournaments it may be a good idea to add a promo Regirock to the deck, as that also has the Omega Barrier Ancient Trait and is a Basic Pokemon letting you easily search it out with Korrina on turn 1 and then begin powering it up. The biggest thing this deck has going for it, I believe is the inclusion of Super Rod and Bunnelby, which will allow the deck to recover resources to not only avoid being decked out, but also allowing it to get back cards like Lysandre and Xerosic to stop Sableye from being able to infinitely loop Life Dew against it. I expect this deck to see play both with Tropical Beach, as well as with Scorched Earth by players who don’t have access to Tropical Beach. Headed into this weekend of Regional Championships I expect there is going to be a lot of players who have absolutely no clue what they want to play this weekend. For players with no clue what is going on, then Vileplume/Vespiquen is probably their best bet as it is the type of deck that could lead to a good tournament run if you run into the right matchups and win a lot of the opening coin flips. This list is mostly standard fare for the deck, but I’ve included some small tweaks to the deck in an attempt to patch some holes that the deck has. The one AZ can be very good for a few reasons. It can allow you to get a Vileplume out of the Active if you couldn’t draw into a Float Stone early and it ends up getting Lysandre’d out. Additionally, it can be used mid and late game to pick up Vileplume to allow you to play Items to win the game. I put Red Card back into the deck as the margins for winning games with the deck are shrinking, so maximizing the probability that your opponent draws a bad opening hand is too good good to pass up. Your opponent may also try to setup their next turn by using a VS Seeker for a Supporter, so a Red Card could put them back into a hand without a Supporter. 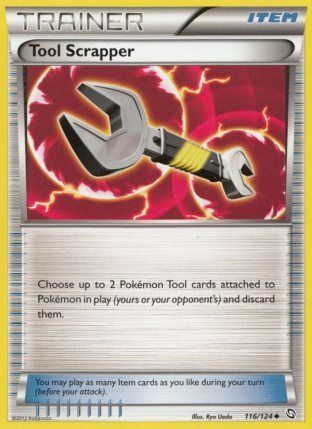 The one Tool Scrapper is meant to be used against Sableye/Garbodor decks to prevent them from being able to get a Garbotoxin active if they get a Float Stone down going first. It can also be good for removing Float Stone from Keldeo EX’s against Yveltal to deny them permanent mobility in the game. As for the Sableye matchup in particular, the way I approach the matchup is to try to get two Vespiquen evolved and use those as my attackers while avoiding using Mew EX. The reason I do this is because Sableye decks may try to Confuse Ray you, and Vespiquen luckily has free retreat so we can just retreat into another Vespiquen and attack with that if we do get Confused. It can be a good idea to get Shaymin EX off the field with Sky Return before you start attacking with Vespiquen. The reason you may want to do this is because the Sableye player could use an N or Ace Trainer, and then follow it up with a Lysandre on the Shaymin EX . If you don’t draw into a Double Colorless Energy then, it could remain stuck in the Active position, and then they can start using Burrow with Bunnelby, and if they discard a Double Colorless Energy it could become game over. One of the surprise decks of the first weekend of Regional Championships was the Raikou BKT/Eelektrik NVI deck that Eric Rodriguez and Azul Garcia Griego used to make Top 8 at the Virginia Regional Championship. This is a deck that with some tweaking, I believe could be a major threat to do well at this weekend of Winter Regional Championships. Here is how I would build the deck to take on the Sableye meta game. I think the Seismitoad EX would be helpful against Yveltal EX decks as well, which can sometimes win the game by chaining together enough Hex Maniac. 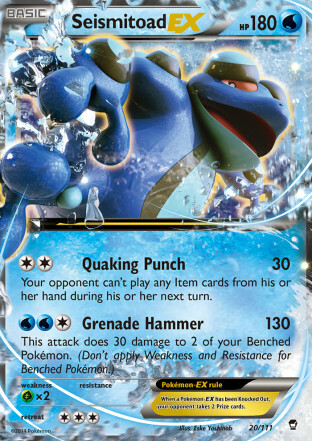 You could use Seismitoad EX to Quaking Punch to prevent them from being able to use VS Seeker to continuously get Hex Maniac and use that time that Seismitoad EX buys you to power up some more Raikou to take it hard against the Yveltal decks. Yveltal EX/Archeops NVI/Gallade BKT decks have already taken home Regional Championships in the first two weekends, with Daniel Altavilla winning Virginia and Brad Curcio winning Collinsville. I don’t see much of a reason why Yveltal EX/Maxie’s decks can’t win another Regional this weekend, in fact I would predict that Yveltal wins at least one of the Regional Championships to be played this weekend. 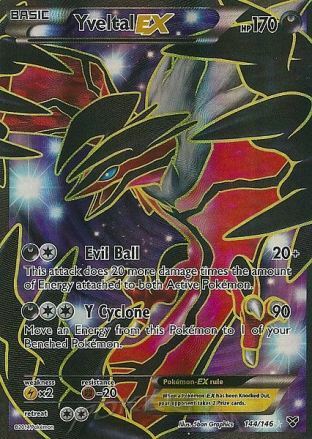 The reason that Yveltal EX is poised to do well again is because it is the single best major meta deck at countering the Sableye/Garbodor deck and it also can be built to be very strong against decks like Vileplume/Vespiquen and Primal Groudon EX which might pop up to counter Sableye. 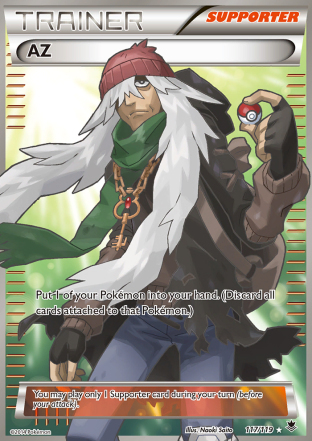 I expect players to play a mixture of both Maxie’s and non-Maxie’s versions of the deck. 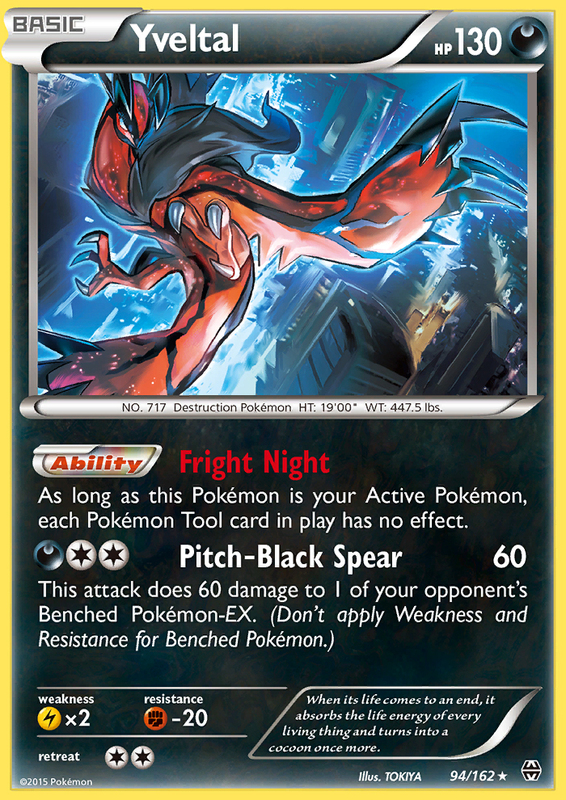 I think that Fright Night Yveltal will be one of the major MVP cards of the weekend. It already saw some great success last weekend, with Israel Sosa playing two in his Yveltal/Maxie’s deck. The card is great for simultaneously setting up knockouts for an Yveltal EX or Darkrai EX, while also potentially snagging two prizes on a Jirachi EX or Shaymin EX at the same time. 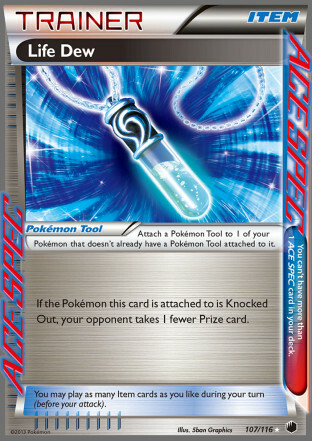 It also is very useful against Vileplume/Vespiquen for locking stuff active, and I think it will really shine for taking knockouts against Pokemon with Fighting Fury Belt. Additionally, matchups against Mega Pokemon decks become a lot easier when you not only shutoff their Spirit Link, but can also snipe them to make them softer for Yveltal EX to knockout. The hype will prove to be real, and the Sableye/Garbodor deck will prove to be insanely good with the help of Puzzle of Time. This doesn’t mean that it will be unstoppable, as plenty of good players will choose to counter it, but it will feast upon the unprepared and put up a good fight against those that do come prepared. Even if Sableye can’t win the tournament, the entire meta game is entirely revolving around it at the moment. My predictions for this weekend: Yveltal wins Florida and Sableye wins Oregon.